Linda and I rolled up on an astonishing scene in the Serengeti. 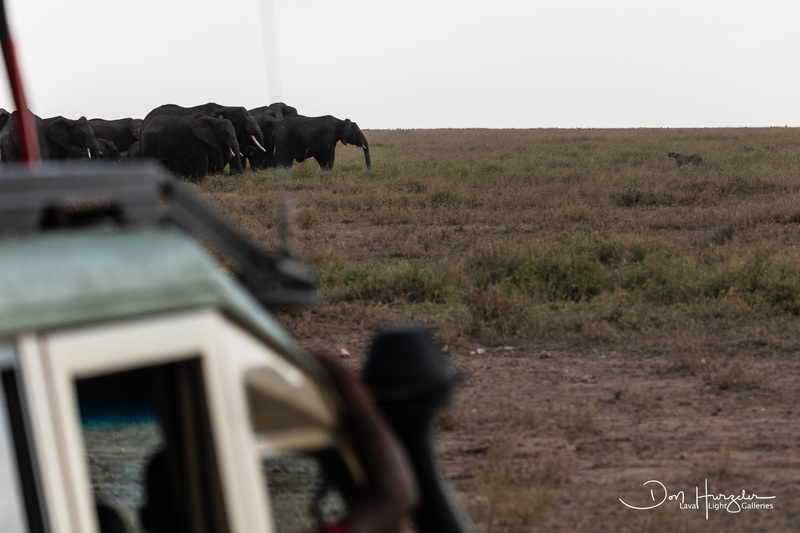 Unfortunately, we were not the only ones who rolled up on it…several other safari vehicles beat us there. Our view of the event was from well off to the right and our cameras had to point directly into a pure white/gray sky. Not exactly perfect for picture making…but amazing to watch. A cheetah we had photographed earlier went on a hunt. 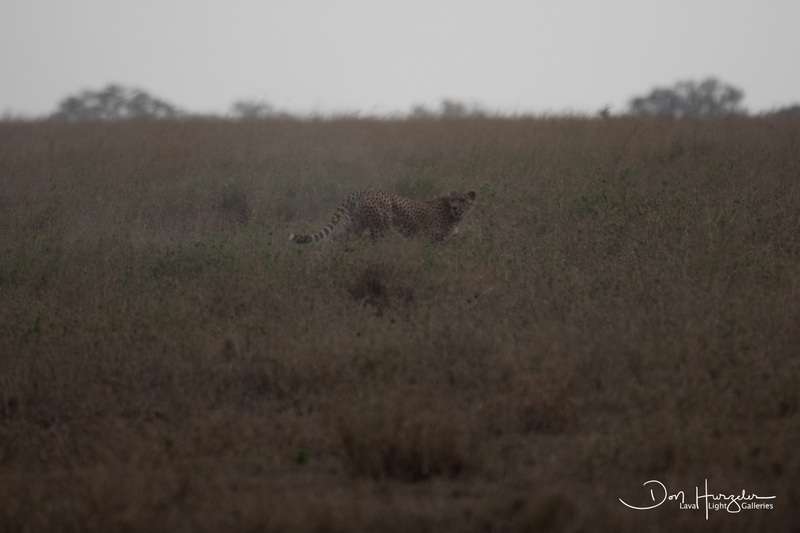 We watched the cheetah glide through the tall grass in search of a meal. When a meal was found, the cheetah took after it at full speed and appeared to have gotten its prey. By then, we were a long ways off and had to reposition the vehicle to get a view of cheetah and whatever it had caught. This caused us to circle around over quite a distance…took us several minutes. When we did get back in decent position, several other safari vehicles had beaten us to the site and kept us from getting close. I cranked out the 600 mm lens and started shooting. The cheetah did indeed have a kill. 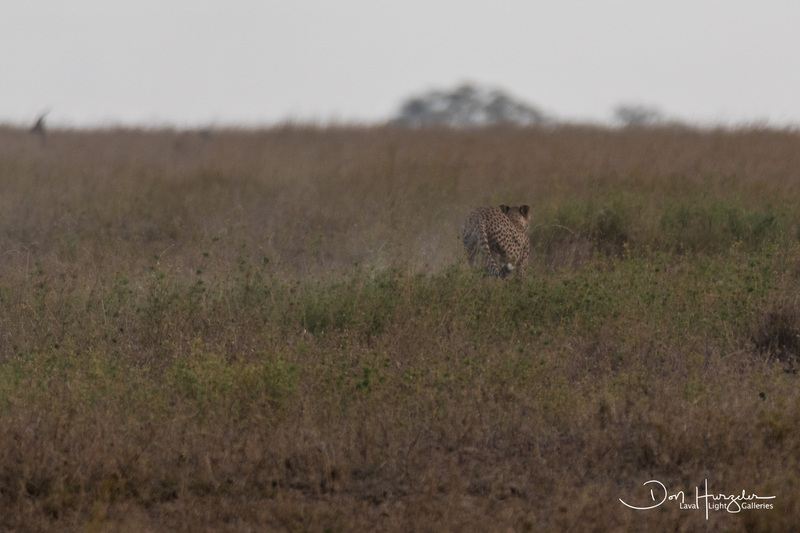 The grass was high and I could clearly see the cheetah but not the kill. However, to the left was an entire family of elephants…big bull elephant in the lead, some moms and a few kids…maybe 10-15 huge animals in all. 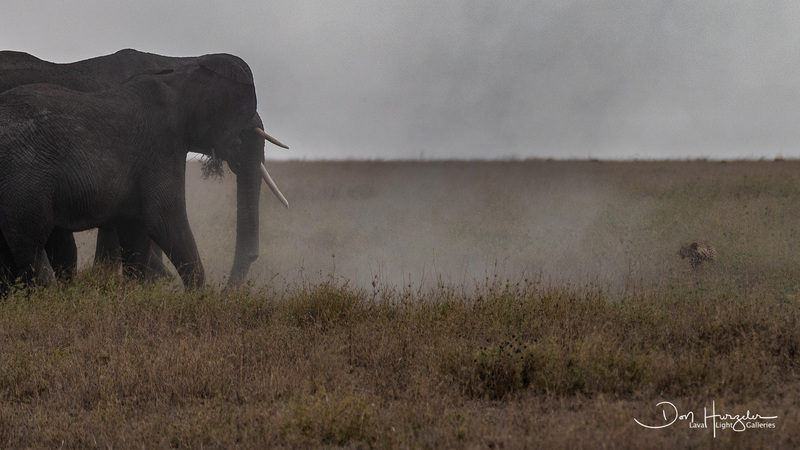 The elephants were on a direct path that would take them over the cheetah and the kill. The cheetah would have none of it. He/she stood up tall and refused to move. The elephants saw this as a threat and began to stomp the ground, throw around their trucks and trumpet warnings to the cheetah. 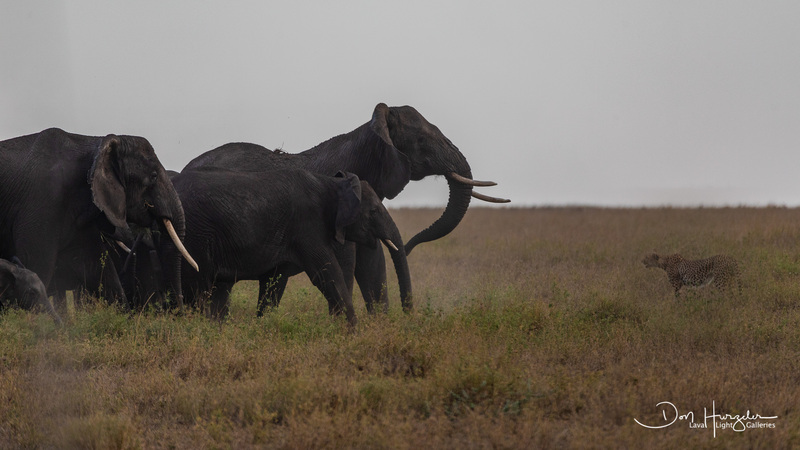 The stand off lasted a few minutes…this small (by comparison) cheetah and this giant force of pissed off elephants. Lots of dust in the air…lots of sound. Finally, the lead bull elephant seemed to raise up on his back legs (I think…could not see it clearly), came down to stomp the ground and trumpeted loudly. At that, the cheetah turned and walked away. The lead elephant chased him and the cheetah started running. The elephant stopped within maybe 50 yards and the cheetah turned around to see that the chase was over and things could return to normal. Did the cheetah return to the kill? Don’t know…but I assume it did. Here is what I do know…I know that cheetahs are one brave species…they will not give up their kill willingly and will stand their ground til almost the last moment. Reminded me of my spear fishing friends here on the Big Island. I’ve seen them spear a fish…have a shark come up like a lightning bolt to take that fish away…and my brave friends WILL NOT give up that fish. They fight the shark for it and I head directly for the boat and get the heck out of the way. Cheetahs are the spear fishermen of the Serengeti. A word about the following photos…they are the worst quality photos I have ever posted. With the white/gray background, our angle and the distance involved…these were never going to be any good. However, they do document an event that Linda and I want to always remember, so I am posting them here. They are all exactly as shot…very little editing because…why waste the time…they are crappy shots. All have been cropped to bring the subject closer and eliminate as much of that horrible sky as possible. The third one in the series…the cheetah right in the face of the elephants IS ALTERED by me and I want to make that clear. The photo before it shows the accurate distance between cheetah and elephants. In the next photo the cheetah was a bit closer…but only a bit. I cut out some (maybe ten feet…kind of hard to measure) of the middle ground to give a clearer view of the shot. We do not do that in any of the shots we sell…they are what they are…but I have no hopes of every selling this photos so I wanted it to at least show the scene in a bit more detail. Not trying to deceive anyone. Lots of brave animals in the Serengeti. I love that they stand up for themselves and take on big challenges. I also love that they have the good sense to eventually retreat if absolutely necessary. Neither Linda nor I wanted to see a cheetah stomped to death by an elephant that morning and happy it turned out as it did. Posted in Uncategorized on October 19, 2018 December 5, 2018 by Lava Light. ← Previous: "Epic Crossing of the Mara River…The Great Migration"
Epic story! We feel your pain regarding lousy light, but we agree with you these photos were well worth posting because you saw a once in a lifetime event! Thanks for sharing this amazing encounter! Still great pictures, for the story they tell if not the photos themselves. Once again, you photos, however crappy you think they are, are brought to life by your narrative. I would love to witness that type of encounter. It’s probably a daily occurrence in the Serengeti! Thanks Don, and hope you heal quickly! Shared about a year of my life with a cheetah named “Boss” who lived at the Lake Macilwane Snake Park near Harari in Rhodesia (as it was then). He was great mates with an alsation dog a wonderful story that I would be happy to share with you if interested. Get well soon, friend. Praying for you. I would love to hear the story! Aloha. Thanks again Don, for your ability to be a great story teller. Sorry about your surgery. This is not the first time as I recall. You must start NOW doing something to protect your skin or you love of photography will not be possible. I know I know you know but I care so there!!! Love you my friend!!! Judy ??? Thanks Judy. As you are older than me, I will listen to your sage advice. My torso skin peel is done and I am healing up. Started one on my arms and it is not showing much damage. The face is next, probably in January or so…my fourth so I know what to expect. Patch, patch, patch. Aloha. Fascinating. Given that the elephants would have no interest in the kill, one assumes the cheetah eventually got his food. Brave but foolhardy to try to keep so many elephants away. Lucky you got to see it, and poor quality photos by YOUR standards can still tell the story. It was just an amazing scene. I captured it a little…but it was way more. Would have to been too close to capture the sound, the stomping on the ground, the dust up in the air, the stare down…nature is pretty tough. Aloha Cary.